"But don't you think people who hate Notre Dame can't accept this notion that so many Notre Dame players and fans say that praying to God helps the team to play better, and, in many cases, to win?" I asked Coach Holtz. "I don't think God cares who wins a football game," Holtz stated, then paused just long enough to let you know something was up. "But I do think His Mother does," he added with a wink. The above quote is from a book (Champions of Faith: Catholic Sports Heroes Tell Their Stories) which I wrote several years ago and which your predecessor, John Paul the Great, so graciously placed on the shelves of the Vatican Library when he started the Pontifical Council of Church and Sports a few years ago. In a whimsical way, it illustrates why so many devout alumni (I myself am a 1981 graduate) and "subway alumni" feel so strongly about Notre Dame—and why we feel Fr. Jenkins' disobedient and disloyal invitation to President Barack Obama to receive an honorary degree and give the commencement speech there, is an affront to Our Lady Herself. And, since this action means the very name of Our Lady is at stake, I regretfully submit this situation to your personal attention. With over a billion Catholics, thousands of priests and religious, and hundreds of bishops under your care, I'm sure that usually the issue of a renegade reverend overstepping his authority is best left to the local bishop (or bishops) to handle. But in this case, not only has N.D. President Fr. Jenkins dissed his diocesan bishop (John M. D'Arcy) and ignored the clear teaching of the whole Council of Catholic Bishops by inviting an ultra pro-abortion leader whom the noted Catholic novelist Michael O'Brien says carries the potential to become the Antichrist, he has also brought the University students to shame and the country's Catholics (as well as non-Catholic Notre Dame supporters) to scandal. Still, why intervene here, when there are Catholic universities (such as Ave Maria or Steubenville) far more faithful to the Church's teachings, and others (like Catholic University) with closer ties to the Vatican? Because, despite its many failings, Notre Dame is still, as Cardinal Francis George would say, "the flagship Catholic university [in the country],"—and you may be the only one left with the power to save it. Your Holiness, I see three basic reasons why Notre Dame must be rescued at this present time from this current situation. 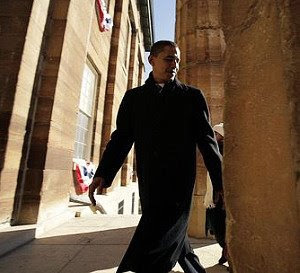 First, Notre Dame is without question the most visible Catholic university, with by far the biggest Catholic platform—which is exactly why glory-seeker Obama desires to scale it. Yes, Jenkins' predecessors have sometimes traded Truth for beauty to get to this position of prestige, but that is all the more reason you cannot let this final deadly deal with the enemy go down. Secondly, because of Blessed Basil Anthony Moreau's (the Holy Cross founder's) saintliness and Fr. Edwin Sorin's persistence, Notre Dame, with it's Golden Dome, Gothic Cathedral, Grotto, and countless statues of Christ and the Saints, has become a bona fide worldwide Marian shrine. 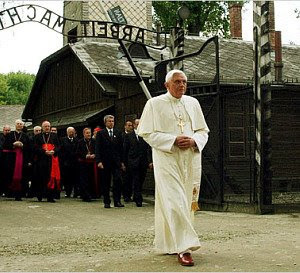 So on the one hand, for authorities to simply declare Notre Dame no longer Catholic because of a faulty faculty is like saying Lourdes is no longer a place of miracles because it has a pompous PR person; to have a Holy City run by unholy leaders (as Rome was during the era of Alexander VI or Leo X) is certainly a source of confusion, if not scandal. Finally, while it may not be as universal as during the days of Rockne and Leahy, there are still millions of youths who, at least initially, look up to the University because of its sports teams—they "worship" the Fighting Irish heroes en route to a deeper Christian identity. Will not the invitation, invocation, and symbolic (through awarding the President an honorary law degree) coronation of Obama send a message to the children of the Notre Dame nation that they should now idolize the unborn baby-butcher Barack? While declaring his disgust with Jenkins' decision, Cardinal George also said that, despite the fact he is President of the United States Conference of Catholic Bishops, he has no direct authority in this matter, adding, "you just don't do that [disinvite the president]." He can't, Your Holiness, but YOU can. Although you are the complete opposite of Obama; a soul who sought to flee this position of power rather than pursue it by every method (just or unjust) possible, God has nonetheless entrusted you with this greatest of authority for a reason. As perhaps the only man on earth with more authority than this present President of the United States, you are the only one left who can legitimately stop him. He has already risen to great power in America; please do not let him enhance his near invincible image by capturing Notre Dame. Thank you for your time; as Notre Dame's loyal son and your faithful servant, I humbly await your decision. P.S. If you ever make it out to South Bend, I'll treat you to a football game! God bless you! This was a well written letter.